Sidharth Malhotra and Parineeti Chopra are all set to team up once again after their romantic comedy Hasee Toh Phasee, this time for a film titled Jabariya Jodi. The film went on the floors last year and the actors have now wrapped the shooting of the film. Sharing a video on his social media handle, Sidharth Malhotra posted about his journey of working on the film. From what we see in the video, it looks like they shot for a fun Holi song. Writing about the film, her wrote, "The crazy journey of #JabariyaJodi comes to an end! Thanks to the entire cast & crew for their endless support. Can't wait for you guys to watch the film in cinemas on 12th July 2019." 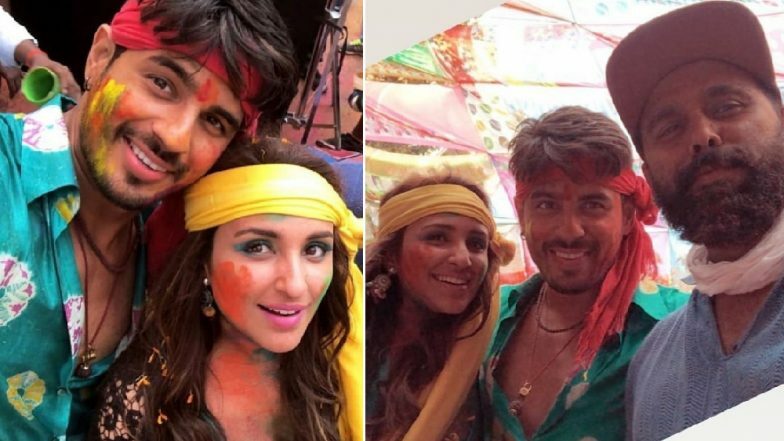 A few pictures from the sets of the film have also been doing the rounds where Sidharth and Parineeti are seen in their Holi song getups. The film Jabariya Jodi revolves around the practice of groom snatching which is also known as 'pakadwa vivaah' in Bihar. Siddharth Malhotra and Parineeti Chopra’s Jabariya Jodi Avoids Clash With This Ajay Devgn Film; Finds a New Release Date. Speaking about taking up the project, Sid earlier spike in an interview saying, "I was aware of forced marriages taking place in Bihar. I did my own research on the subject as well and came across a large number of such incidents that also happen in UP. Come to think of it, these are only the cases that were reported. When I heard the story, I was excited about it and took it."